When you first install QODBC it automatically activates a "once-off" FREE 30 Day Evaluation... beyond which QODBC will stop working and you will need to purchase a CDKEY. Once you have received your CDKEY you need to click on Start -> All Programs -> locate the QODBC Driver for use with QuickBooks program group on your desktop. 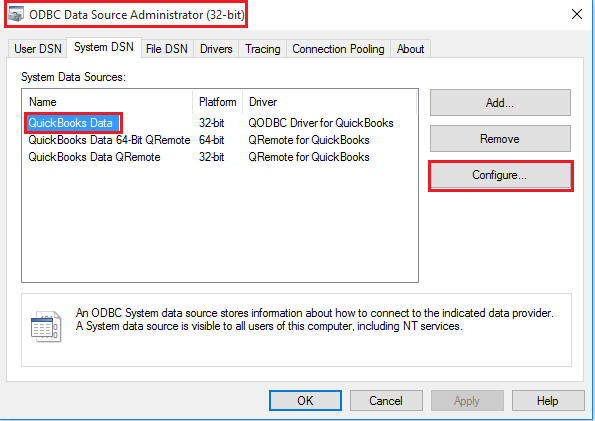 Click on the Configure QODBC Data Source icon to launch the setup program. 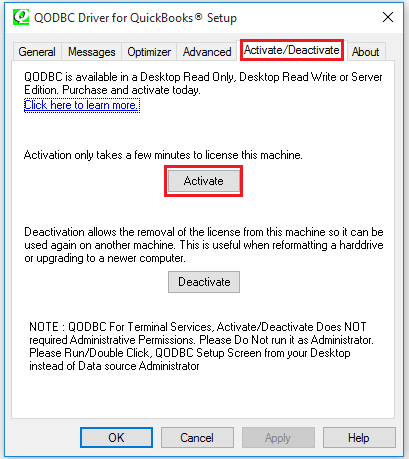 Select the Activate tab page in the QODBC Setup screen and click on the Activate button. Enter your 16 digit CDKEY (with the - dashes) and click on the Manual button. 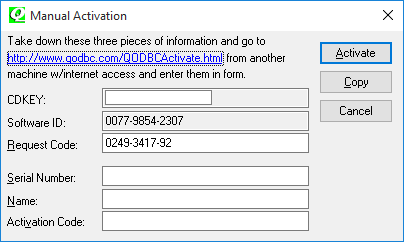 Copy the information from your computer screen into the image directly below and click on Process to generate a code to activate QODBC. Click on the Copy button to save your CDKEY. If you have correctly entered your CDKEY, Request Code, and Software ID, your activation will now be processed. 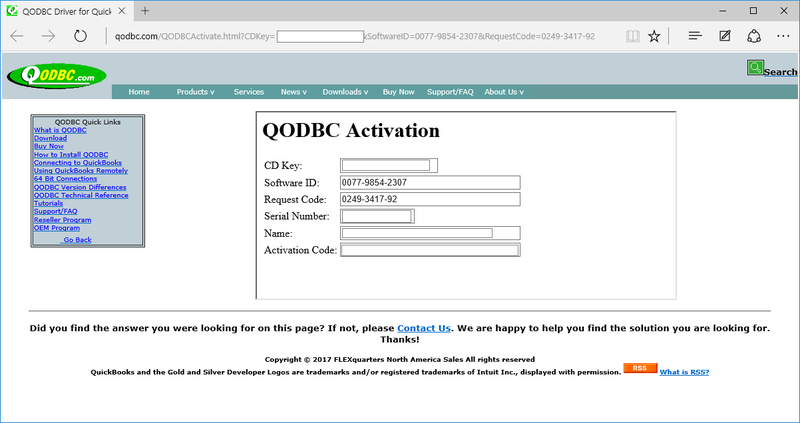 Click on the Manual button on the computer that has QODBC installed on it and copy and enter your Serial Number, Name, Request Code and Activation Code from the above image and click on the Activate button when done. If you have entered the information incorrectly, or have exceeded your purchased quantity of license seats, you will receive a "CDKEY not found" message. Your copy of QODBC is now successfully activated! Click OK to continue. 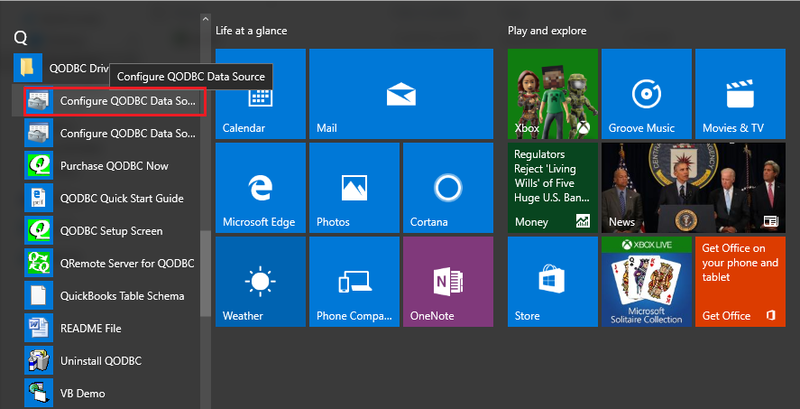 I am unable to Activate/Deactivate the currently installed version. I am logged in as Administrator, with admin rights, and right-clicking on the Setup and selecting "Run As Administrator" does not change the result. You do not have Sufficient Permissions. Please run QODBC Setup Screen as Administrator. Also, make sure your current user has a password and try again. Solution 1: Try from Data Source. Click Start -- > All Programs -- > QODBC Driver for use with QuickBooks -- > Configure QODBC Data Source. Alternative: The 32-bit ODBC manager on 64-bit Operating System can be found at C:\windows\sysWOW64\odbcad32.exe. Switch to System DSN -- Click QuickBooks Data -- Click Configure. These will Open QODBC Setup Screen. Switch to Activate/Deactivate window and try again. If you have entered the information incorrectly, or have exceeded your purchased quantity of license seats, you will receive a "CDKEY not found" message. You need to deactivate a license or purchase additional license seats. 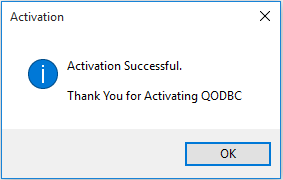 The only other reason for an activation not to work is if for example if you purchase a QODBC USA CDKEY and try to use it with the Australian version of QuickBooks or if you purchase a Desktop license and need a Server Edition license. If has deactivated qodbc from first computer and then need to activate it on the new computer, but when try it, the following message appears: returned from QODBC activation server: <html><head><title>Error</title></head><body>The parameter is incorrect. </body></html>. 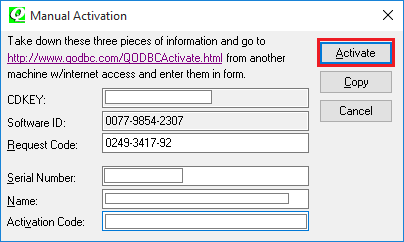 The error indicates that you are using an ADSL type connection or your firewall is preventing the connection and you will need to manually activate QODBC using the Manual activation method shown above. Following are steps can be followed to upgrade from Read only to a desktop Read Write edition. Step 3: Activate the Read/Write license as per above. You've hit the ball out the park! Increidble! Quick question. How do I obtain the Free Read only version of QODBC that QB Enterprise says exists and will not be a trial version? When QODBC is installed on a new machine it starts with 30-day evaluation (All features are active). QODBC evaluation version will turn to Read Only edition for QuickBooks enterprise edition – automatically after 30 days (If QuickBooks Enterprise Edition v10 or above is installed). So QODBC will turn to Read Only edition for QuickBooks enterprise edition – automatically after 30 days.